The city’s 375th anniversary is a pretty good excuse to highlight some of our historic buildings and as we move into milder doorscursion-friendly weather I’m hoping to get around a little more in order to do just that. 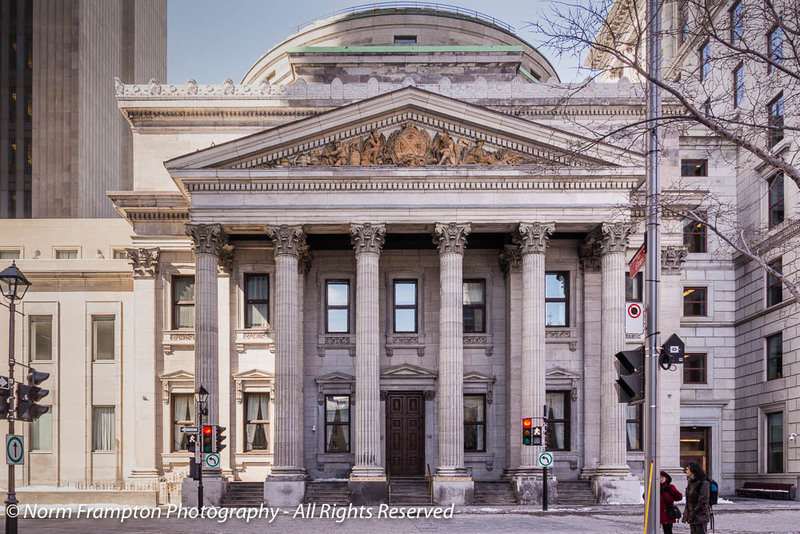 This week we’ll look at the Bank of Montréal’s Head Office Building in Old Montréal. Note: These pics were taken a few weeks ago when there was still some snow on the ground. Thankfully the snow has melted since then. 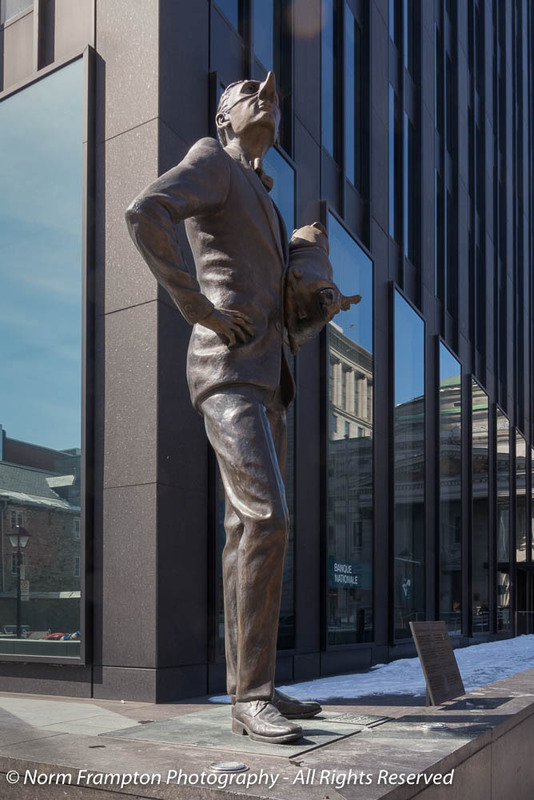 In June of 1817 along with eight local merchants, a wealthy British loyalist named John Richardson formed a partnership to found the Bank of Montréal. 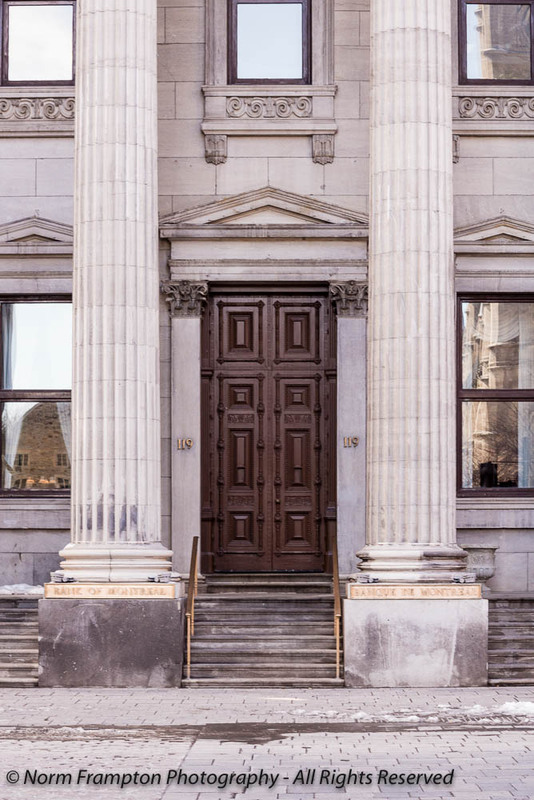 In November of that year they began operating out of a rented house near the old port, establishing it as the oldest banking institution in Canada. Within a short time they moved into their own building nearby, several streets south of the old port in 1819. Of course a bank that was within walking distance of the trading ships, and merchants’ warehouses of the old port was destined to flourish, and with their success they were able to move to the current location they built for themselves on rue St-Jacques in 1847, in the northwest corner of Place D’Armes square, across from the city’s most famous church, the Notre-Dame Basilica. Yes, this place has some great doors that we’ll look at next week. 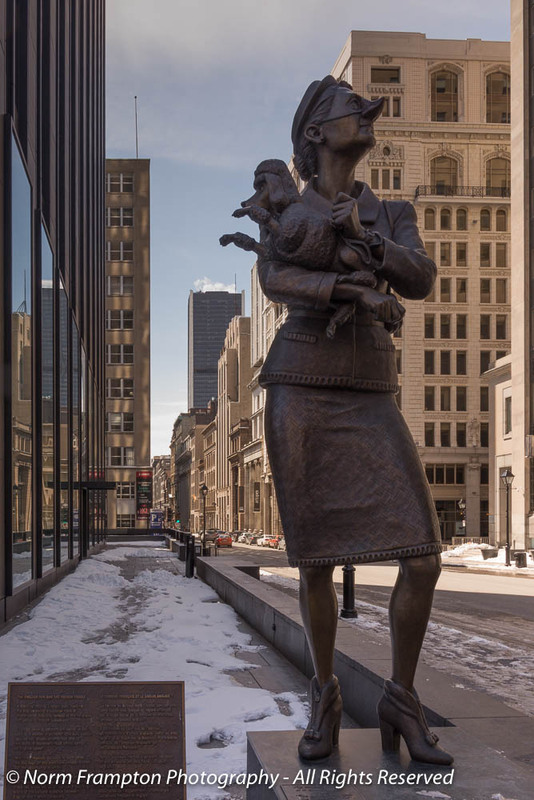 The irony of English business money and old religious French Catholic values sitting directly across from each other is depicted in a 2-piece sculpture that sits at each end of the square today. Beyond the facade, the rest of the building was redesigned and expanded in 1905. Today the lavish interior echoes the success of this institution and even contains a small Bank of Montréal Museum that is open to visitors at no charge, during banking hours. If I can get back there on a weekday when the bank is open, I will definitely make sure to take a peek inside. Despite the fact that this is still called their head office building, the corporate operational head-office of the Bank of Montréal relocated to downtown Toronto back in 1977, due to political uncertainty caused by the election of Quebec’s first separatist-led provincial government the previous year. 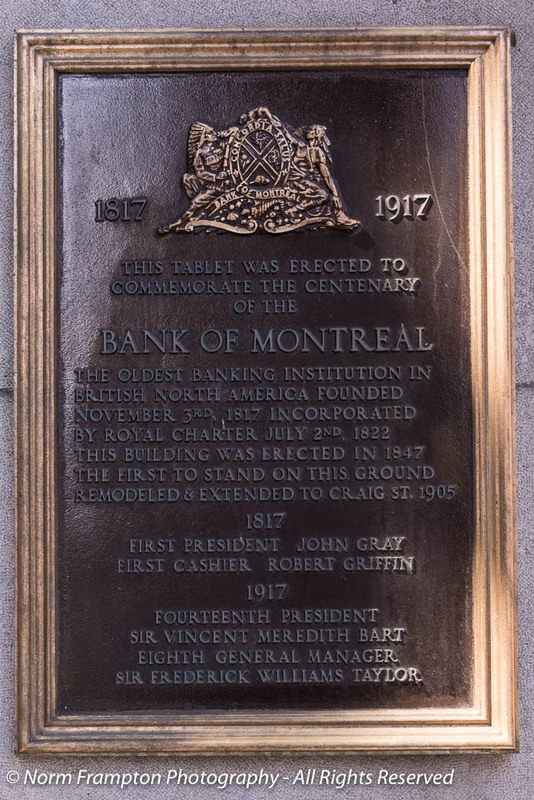 Today the Bank of Montréal aka BMO is the fourth largest bank in Canada with over 7 million customers served by 900+ branches from coast to coast – though only a handful are as lavish as this one. By the way, if you were ever wondering where to invest that nest-egg you’ve been hiding under your mattress here’s an interesting tidbit: This company has not missed a quarterly dividend payment since 1829! That’s right folks, they’ve payed dividends to their shareholders consistently all through World War I, the Great Depression, World War II, and even the 2008 global financial/banking crisis. This makes the BMO’s dividend payment history one of the longest uninterrupted streaks in the world. 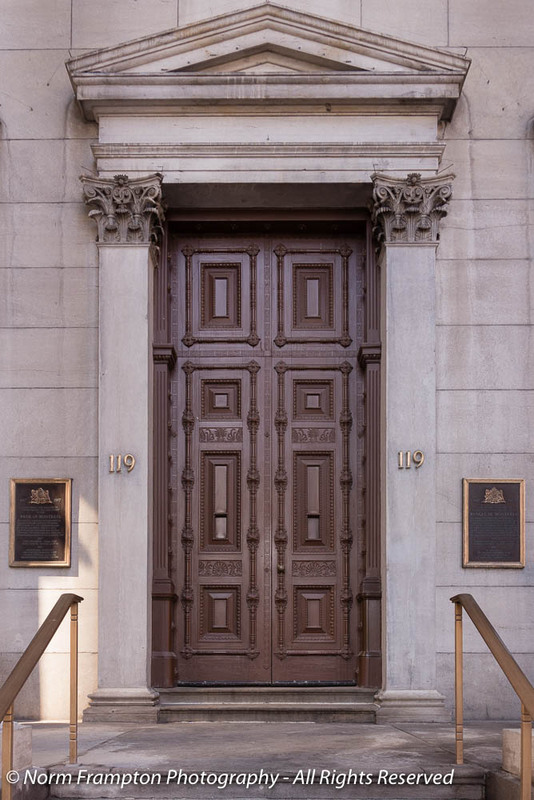 Gallery | This entry was posted in Photography, Thursday Doors and tagged Bank of Montreal, BMO, Canada, Doors, Historic Architecture, Historic Buildings, Old Montreal, Old Port of Montréal, Québec, Thursday Doors, Vieux Montreal. Bookmark the permalink. Wow! Those are some amazing buildings and so beautifully captured. That sculpture is rather amusing. lol. I remember when BMO came to Naples towards the end of my time living there. I’m not sure if they are still there or if they’ve sold the banks that they purchased. Smiling here on my first visit. I grew up in Montreal, worked for years at BMO in Place Bonaventure. My stepson works in that very building!! And my first wedding was across the street in Notre Dame chapel!!! Small world isn’t it? Your stepson is lucky to be able to go to work every day in a building that is also a wonderful piece of art. Gorgeous doors and fantastic photos of the two buildings! 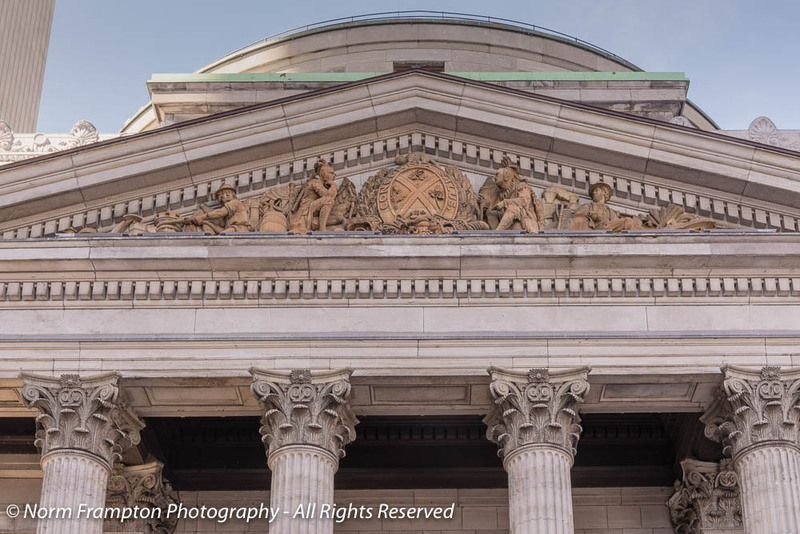 Banks seem to always be built majestically and you captured its essence including the doors and history. Love the statues; they add to the character of the building. That’s a beautiful bank. Its doors are pretty too. What a gorgeous building with an impressive history! Your bank is beautiful, and the doors are stunning. Tall, wood doors are very stately, especially when wearing such ornate carvings. “Going to your bank’ makes me want to dress up! Thanks. Can you imagine dressing up to go to the bank today? Both the bank and the church are beautiful! The two statues are humorous:) Fun to think to go through the stately born door to deposit one’s money. I smiled about the logic of the bank to “show” their riches and security in money” since that seems the motto overall in the Northern part of this continent. I grew up with almost the opposite: Don’t show your riches, for someone will steal it. Quite a distinguished bank! Are the figures in the sculptures wearing false noses? I love those sculptures too! What an interesting description of two cultures… it could probably be applied to many. Thanks for providing some history about these two magnificent buildings, and I love the two snobs with their dogs! Thanks for the Stock advice! This is a beautiful building. I got a nice low light image of it in the square on my last visit. I agree that it deserves to be noticed. Great photos of the Bank – the top one really conveys its size (depth as well as height), and the way it sits there so solidly! I didn’t know there was a museum inside – must go and check it out! Thanks Susi. Until I started researching it I was not aware of the mini-museum either. I’m looking forward to going back to check it out. It was a different time back then. Today they would be torn apart on social media if they tried to build something like this for themselves. It’s a beautiful, stately building, and those are fantastic doors, and I’m pretty impressed by the rate of return! Great post! You amaze me with your consistently excellent door posts. I don’t know where you’re copying your links from Ian but this link and the one you posted on the link-up list are not links to a valid post. Make sure you’ve saved your draft or scheduled your post before copying and pasting the link. I’ll try to take a few minutes to find your actual post and fix the link for you. Beautiful architecture and doors, Norm. 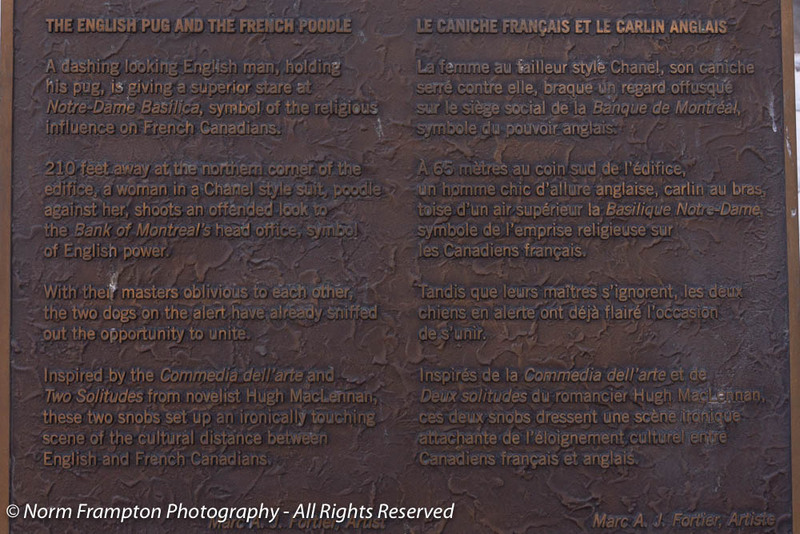 But the two-piece sculpture is what caught my eye and really typified French Canada for me, very cleverly done. Thanks Janet. Apparently that sculpture has been there for years and this was the first time a actually noticed it. Thanks for the history, the beautiful photos and the stock tip, Norm. I love the main entrance doors, but there is that feeling of “if you can afford this, I wonder why you’re paying me so little interest.” I think the other thing that is long gone, is a desire by businesses to support and improve the cities where they are located. The expansion and growth to regional, national and international, has diminished the importance. Sorry for that. I do like that this building has been well-maintained and is still in use. I really like that they’ve added a small museum. Good choice for today. Thanks Dan. I agree that corporations generally do less than they used in terms of contributing to local beautification. On the flipside at least here, they do spend an awful lot sponsoring youth sport and major international events. I have to admit that I can’t help but be a bit skeptical of this type of ‘strategic philanthropy’ though. Recently, two large insurance companies agreed to give Hartford a bunch of money for some good projects. Maybe it’s not all gone away. Thanks Sherry. No, not an employee; just a fan of beautiful architecture. I enjoyed the post and love the idea of doorscursion-friendly weather. You’ve sold me on that bank, Norm. Between the architecture and it’s steady financial history, I might even be tempted to open an account (this is from someone who is definitely not a lover of banks). 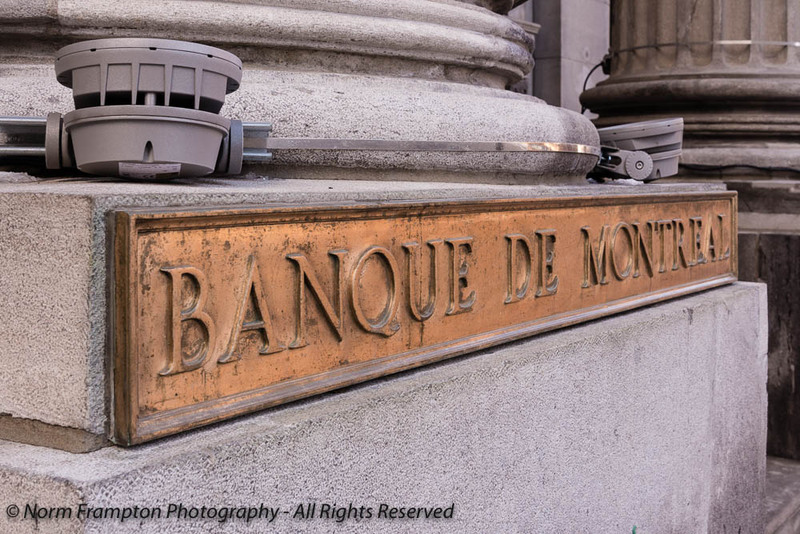 I checked and there’s a Bank of Montréal in Dublin – I kid you not! Thanks Jean. They were okay to do business with. We had our mortgage with them in the past but switched when we got a better rate elsewhere. I’m not surprised they’d be in Dublin, aside from the U.S. they have international branches in almost all the commonwealth countries. 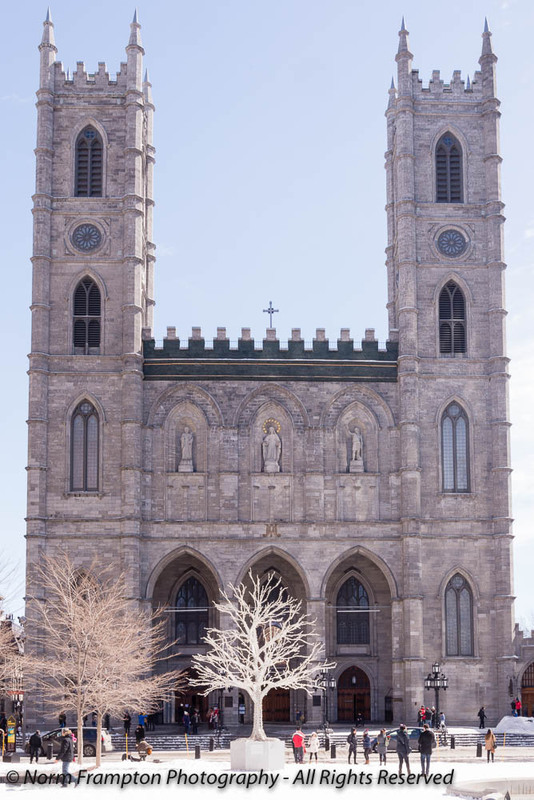 Notre Dame has beautiful architecture….when i visited, I was in awe of it for days! Thank you Anisha, I agree. Notre-Dame is quite impressive. I’ve attended a few classical concerts there over the years; I always walk away silently humbled by the beauty of the place. Wonderful photos. 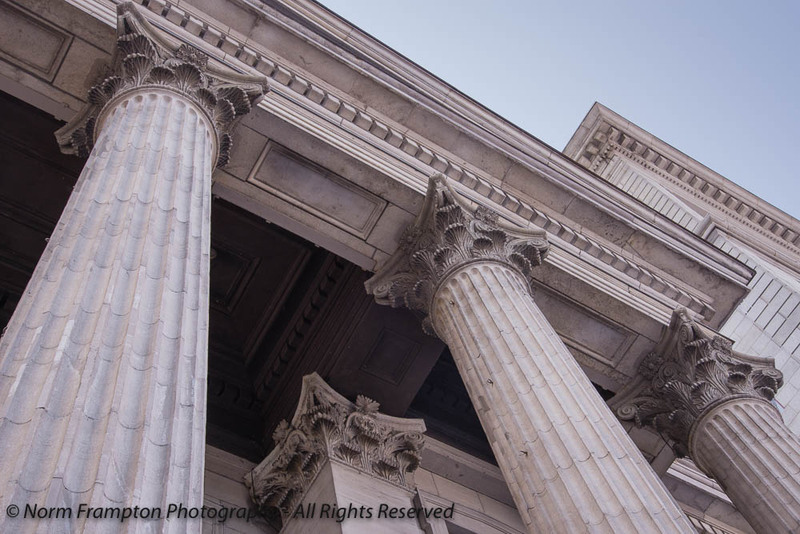 I love these solid 19th-20th century buildings, emulating the grandeur of Greece and Rome with their strong columns. Everything is huge and larger than life, whichever angle you look at it! Thanks Luccia. Banks and insurance companies in particular went overboard during that era. Today sadly, they build for function not for beauty or longevity. Thanks Judy. My only stock tip: don’t bet on the stock market!